English 374 is entitled Rhetoric and Composition. We know these words can mean many things and also, dangerously, can mean very little, indeed can be the rhetorical kiss of death to interest or engagement. Students in the Fall semester class of 374 I had the privilege of teaching were open and alert to what understanding rhetoric and composition could mean in ways that extended the conventional bounds of rhetoric. 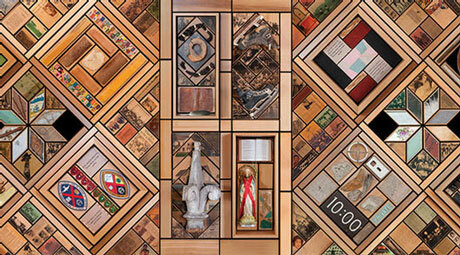 My original goal was to have the class see the Witness Blanket installation, experience it in some way, and in written form connect that experience with ideas about the rhetoric of memorialization or commemoration. Then everything changed when it became clear that with a small extra sacrifice of time we could attend at least one of the evening talks (6 pm Wednesday came only fifteen minutes before class time). The events that took place adjacent to the Witness Blanket installation itself were thus of great importance: more, indeed, because we were there, there to witness the memories, there for the hope of reconciliation, there as ourselves. We specifically attended two evening events as a class: the evening with Cecelia Reekie and the closing evening event. I was particularly moved by the responses to the first event we attended which led to a special request that we also attend the closing. We of course went! “Teaching without a net” gives an insufficient idea of how risky this all felt. The emotional impact of the installation art piece is immense. The immersive impact of attending the talks is greater. Rhetoric and Composition give less support than one might wish to the instructor concerned about the wellbeing and learning of her students. Conventional classes for me typically involve some kind of lecture that I hope situates and demystifies what we are reading, followed by a student presentation, followed by some kind of application of what they talked about, and concludes with trying to find threads that make that particular class speak with what has come before and what we are up to for the next week. The Witness Blanket and ancillary talks preceded classes that involved that usual material but brought to the subsequent class an atmosphere of engagement and emotion I have never seen in my teaching. I think the ceremonial and pedagogic nature of the talks made the safety net, indeed, and made it safe to share and be real in what the calendar suggests is merely pedagogic, learning outcomes driven, good-for-you-but-like-broccoli course. Ethos, logos, and pathos name the rhetor’s palette of ways to persuade an audience. Somehow the dynamic of ceremony and adjacent Witness Blanket installation at the events we attended as a class made us directly attend to the powerful identities of the speakers and ceremonial leaders; I think this led us to somehow reconfigure our own sense of identity, our way of approaching logic, and made our individual emotions participate in the explicit commemoration the ceremony is grounded in, not as bystanders, but as participants. We each I think came away owning in a new way our relationship to pain, sadness, and also to hope. But don’t just believe me because I say this. Below please read some of the students’ responses [given to share by permission of all class members]. …Overall, memorialization is about more than just words. Memorialization is seeing beneath the text, and it is heard below the whispers; it is a window into the soul, a glimpse into the past, a slice of the legacy that we honour and engraving on our hearts that forever immortalizes these experiences and people. It is this memorialization that the Witness Blanket and testimony of Cecelia Reekie portrays so beautifully. They describe the truth behind the horrific acts of the Canadian Residential schools, and the reconciliation of those affected with raw emotion and a revealing sense of honesty, accurate depiction of pain, and focused intent to remember, which is precisely what memorialization strives to be. …One example of a memorial is the Witness Blanket. As a memorialization piece, the Witness Blanket serves as a reminder of the tragedy of residential schools… The moment you see it, you get a sense of how large and magnificent it is. It speaks to the pathos, creating a mixture of emotions, while also forcing us to acknowledge that the events surrounding residential schools really happened. After all, the evidence was on the blanket itself. There is also a performative element added to the display. … and involved for us a speaker named Cecelia Reekie … It consists of a ceremonial display of giving the speaker and the other participants a blanket that covers the body, particularly the heart, to give a sensation of warmth. To observe the Witness Blanket is to accept the ritual of a cultural invitation into the First Nations community to speak and to be heard. The action of remembering is of rhetorical value, and the public is welcomed by a First Nations attendant who speaks to the memories of young Indigenous children who had and continue to suffer from the effects of the residential school project in Canada while ethically and logically appealing for reconciliation and justice for all First Nations peoples. The rhetorical nature of the public address allows for questions or comments which are encouraged from the audience but not required. The First Nations Speaker informs the public that their people are not requesting that Canadians in general need to lead the cause for reconciliation, or get ‘behind’ to push the cause forwards, but rather to walk “with and “alongside” First Nations in the quest for reconciliation, emphasizing the shared need for equality and respect going forward in a modern world…..Upon leaving the display, new memories have been shared with a newly informed public along with the call to spread new knowledge of what reconciliation means for First Nations peoples. Limiting the Witness Blanket memorialization to universities across Canada, however, limits its appeal and excludes the general population of Canadians from an easy opportunity for rhetorical action. Memorialisation is the concrete representation of idealizations and abstractions that are related to one or several events of the past. Memorials demand us to fix our attention of\n something that has happened in history and through its concrete manifestation encourages us to interact with the idealizations and abstractions that it represents, as to preserve the event or events as a memory. When comparing the Witness Blanket with other examples of memorialization it becomes evident that the Witness Blanket is a sound example, hosting features that are both unique to the genre and that are unique within the genre…. There is no photo of people impacted, but the abstraction of thousands of real people with real faces and stories are revealed to “readers” by using artefacts. It is the hope of all who contributed to the construction of the Witness Blanket that these images will fuel new ideas that will then govern the conversations and actions around Canada’s Native Peoples. This the work of memorialisation. To give form to the abstract in hoe that is memory might impact the future. Memorialisation assumes that looking back is a worthwhile practice, that the past can in fact impact our future. Memorialisation suggests that the future needs to be affected, and that with the help of the memories that are preserved in memorials we will be better equipped for a better future.